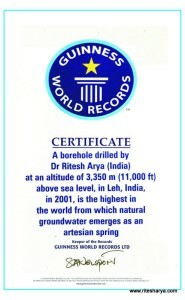 Dr. Ritesh Arya (PhD) founder of Arya Drillers is an eminent hydrogeologist working for exploration and development of groundwater resources in Himalayas since 1993 on “No Water No Money basis”. He has made sincere and dedicated efforts to solve the drinking water problem on sustainable basis in draught hit areas of the mountain states. Doing so his name figured in GUINNESS WORLD RECORD. He was the first to classify Himalayas into various Hydrostratigraphic zones and made Models to explain occurrence and movement of groundwater resources in Himalayas. He published several research papers and presented them in various Seminars in India and abroad. Besides he as interest in tectonics, evolution and Climate change . He has proposed Arya’s C cycle on climate change and based on geological evidences shown that Climate change is Natural cyclic process like day and night and presented various talks on “Global warming and its impact on the ground water resources of the Himalayas”. His concept of AGNEYODGARA (Lava Energy) to provide “FREE SAFE Sustainable WATER & ENERGY for all by tapping MAGMA at shallow depths in geologically favorable locations to produce GIGA watts of renewable energy 24×7 was ranked TOP 10 innovations in World Future Energy Summit Abu Dhabi . 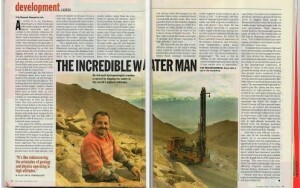 He is member of WG National Institute of Hydrology Roorkee. Recently has been appointed Director,Water and Geothermal Section,International Sustainable Energy Organisation (accredited to UN) Geneva.